I’ve lived in California since 1980 and I’m afraid sometimes the weather is not “normal.” That means it’s either raining too much or raining too little. Not being a native and being from Pennsylvania, this tends to confuse me. Knock on wood, this year is shaping up to be normal for rainfall. So far this month, it has rained 8 out of 10 days. And most days are grey. When I sit at my desk, I can tell if it’s raining by watching for drips on the trash cans and the driveway. The two days the sun was out this week, the birds went crazy outside flying all over. I think they were happy to be dry. Between this and all the bad weather Back East it got me thinking about stitching in bad weather. Many folks tell us that this bad weather is “perfect for stitching.” But is this really true? — quick fixes – projects I can stitch quickly and get done. Then I can have a glow of accomplishment to overcome the grey skies. — easy stitches – so I don’t get frustrated when I can’t stitch something. — bright colors – the subtle shades I often use won’t lift up my mood. I’m craving bright colors. All this came to me in a flash on Thursday night. I was working on a sampler and it was going slowly at best. The accent in the piece is an extremely bright shade of Encore and I was using that. While watching Somebody Feed Phil on Netflix (watch it, it’s good) I got most of a patch done. I realized it was the bright colors that were being an antidote to the grey skies. Now I know I need to concebtrate on the brighter projects in my bag when it rains. 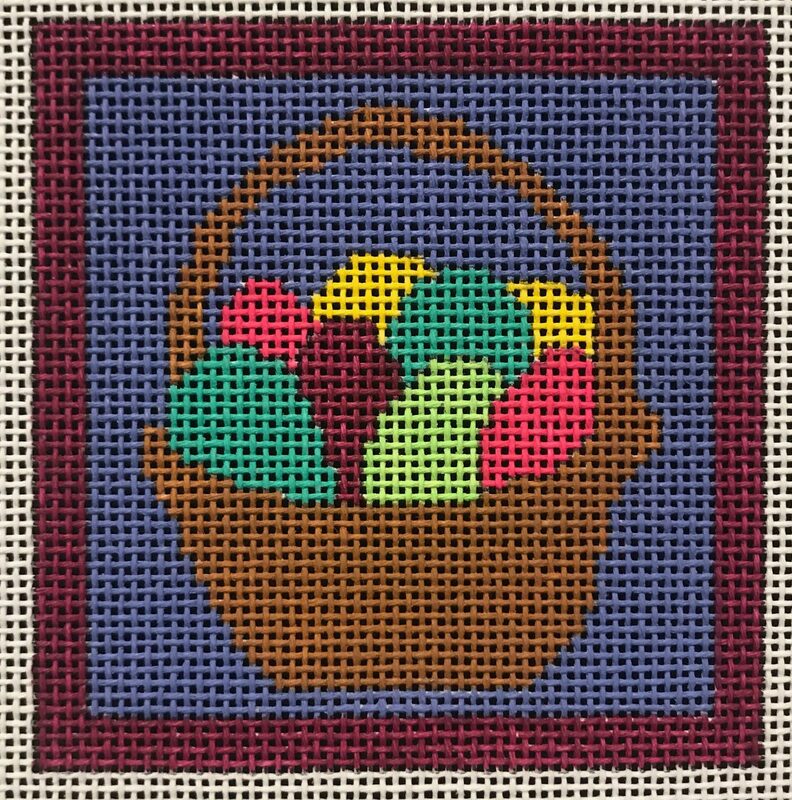 I think today I’m going to work on the Easter Basket but on those lovely bright eggs or the bright and rich background. I’ll save the basket for the sunshine. I grew up in the Houston (Texas) area we knew that after the holidays we had nothing to look forward to but grey and rainy days and nights. This was when my mother got her paint brush out and we all had a new BRIGHT bedroom when we came home after school. To me color is what makes the world go round. I became a needlepointer because of the colors I saw in the first shop I went into. Here in San Diego we got so used to dry weather that we are a bit out of sorts with all the rain we’ve been having. Many car accidents happen because folks forget how to drive in the rain. I am also having to do a lot of weeding – I can’t believe what all is popping out of the ground! I sit near a window and stitch, but mostly just watch the rain come down (a sight not seen much for years). Rain is expected soon here.